Time Fantasy: Monsters| RPG Maker | Create Your Own Game! Time Fantasy is being invaded by monsters! Tribes of orcs ravage the land. The forests have come alive. Creatures lurk in the shadows of dungeons. Heroes charge into battle on horseback. This collection of sprites introduces a huge variety of monsters and bosses to bring your game's battles to the next level. 20 "oversized/boss" monster sprites; 40 regular monster sprites. All monsters have full four-direction walking animations and single-frame battlers, perfect for side-view battles. 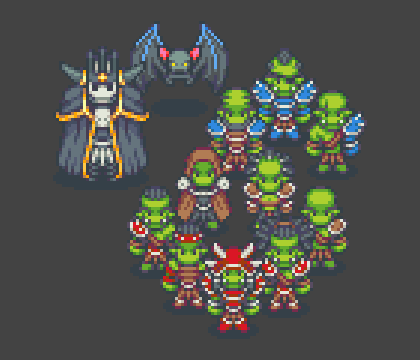 16 unique orc character sprites (2 full sheets). Full sheet of 8 horses. 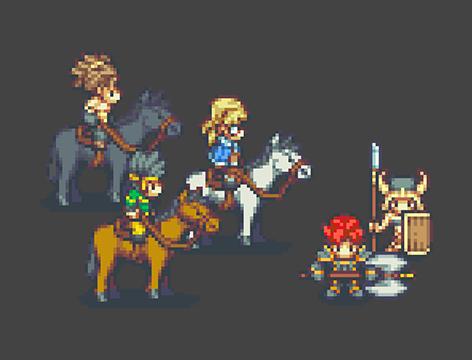 24 new character sprites with emotion animations, pose animations, and horse-riding variations. 16 new NPCs (2 full sheets).